The MMG Education Analytics team, in conjunction with the Australian Catholic University, have refined and aligned a statistical research methodology known as Derived Importance, to help schools better understand which customer experience improvements matter more, and ultimately where to focus efforts and resources. Derived Importance (DI) is a statistical research methodology that develops proxies for importance of various aspects without having to ask stakeholders the actual importance (stated importance). DI reveals the underlying drivers of stakeholders’ satisfaction, which are typically subconscious and may not be clearly indicated from stated importance. DI also gives the opportunity to combine two variables to form new meaningful insights/statistics. Many school survey questions in MMG Education’s portfolio relate to ‘agreement’ and ‘satisfaction’, and these measures are applied across a large number of survey questions. It would be impractical to ask stakeholders the importance of each of these aspects due to time to complete and length of survey. However, MMG Education recognises the value of being able to profile key agreement and satisfaction aspects with an importance dimension. Importance is ‘derived’ by conducting a Correlation Analysis between overall satisfaction with a key area and satisfaction/agreement with aspects within that area. Key areas include Academic Program, Student Wellbeing, Co-Curricular Sport and Non-Sport etc. 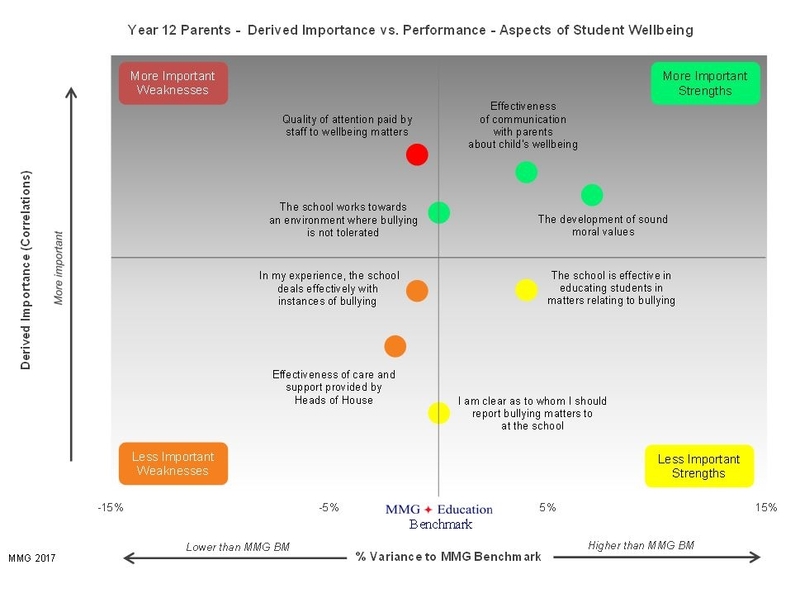 The Derived Importance values are plotted against performance scores, which then positions the key area’s aspects into quadrants for an easier visualisation of priority aspects. Knowing which customer experience improvements matter more will help schools know where to focus efforts and resources on.